PET plastic has a porous structure that absorbs bacteria over time and becomes more porous with each use. Because germs can reside inside the plastic, you can’t always wash them away. Keep plastics containing food or drink out of the dishwasher or other hot places, like your car. The warmer plastic gets, the more it tends to break down, melt, and release chemicals. Most plastic is made directly from oil and natural gas, not recycled plastic. 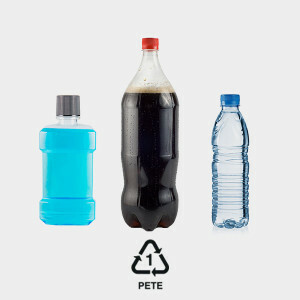 When plastic does get recycled, it is often into products that are no longer recyclable. Metal or glass is always a better choice. Disposable water bottles are made of plastic #1 and can be avoided by drinking filtered tap water instead. Most bottled water comes from the tap in the first place, and taste tests in cities such as New York have favored tap over bottled water. The Atlantic wrote an article detailing the violent afterlife of plastic bottles. Plastic from these bottles lives as long as 500 years after you toss them. This story explains what happens to them in that time, and why not enough plastic bottles are making it into the recycling system at all.